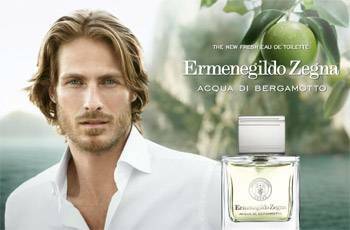 Beyond a thoroughly refreshing and invigorating creation" Ermenegildo Zegna Parfums launches a new fragrance inspired by tradition and modernity, sophistication and sensuality- one that is deeply rooted in Italian style and the invigorating fruit of Italian Bergamot. Emulating the cooling breeze, lush green fields and blue coastline of Southern Italy, Ermenegildo Zegna's Acqua di Bergamotto is reflective of the quality and craftsmanship of Zegna fashion and endowed with the true essence of Italian Bergamot, found only in Calabria, Italy where it is harvested exclusively for Zegna Fragrances. Now Zegna tailors this aromatic hero"touched by the warmth and fluidity of neroli, rosemary and vetiver notes" to a lighter, more refreshing form that is as crisp and sensuous as Zegna's refined white shirts. The perfect juxtaposition of contrasting ingredients, Acqua di Bergamotto is a catalyst of charismatic emotions, well-suited for any man of style to embrace as his own. The packaging was inspired by the codes of Zegna's Essenze Collection design, with an air of freshness that mirrors the character of Acqua di Bergamotto. The bottle is an architectural pillar of glass: simple, square, sensual to hold, featuring the Ermenegildo Zegna crest and logo stamped in gunmetal for impact. It is topped with a shining cap that features a debossed line pattern inspired by the sophistication of Zegna boutiques. This fragrance statement continues with the complementary appeal of an Acqua di Bergamotto Hair & Body Wash and Deodorant Stick, for subtle layers of scented luxury that will appeal to all his senses and essential grooming needs. All products are encased in rich Bergamot green cartons embossed with a linen pattern and stamped in crisp white with a gunmetal Ermenegildo Zegna logo. The Acqua di Bergamotto Collection debuts now at Zegna Boutiques, as well selected Myer and David Jones stores.